This is a summary of what was said by Geert Cappelaere, UNICEF Regional Director for the Middle East and North Africa – to whom quoted text may be attributed – at today’s press conference in Amman, following his visit to Yemen. UNICEF/UN0188083/Mohammed | On 14 March 2018 in Aden City, Yemen, a child is displaced from Taiz because of the conflict. AMMAN, 4 November 2018 (UNICEF)* – “I want this moment with you, distinguished colleagues, partners in the media, to be in memory of Amal. Amal’s emaciated body was last week on the cover of the New York Times and shocked the world. But now sadly, she passed away on the 1stof November as you all know. Unfortunately, Amal is not the only Yemeni child suffering that fate. Berlin, 2 November 2018 (IOM)* – IOM’s Missing Migrants Project (MMP) estimates that at least 3,114 people died or have gone missing on migratory routes across the globe in 2018. 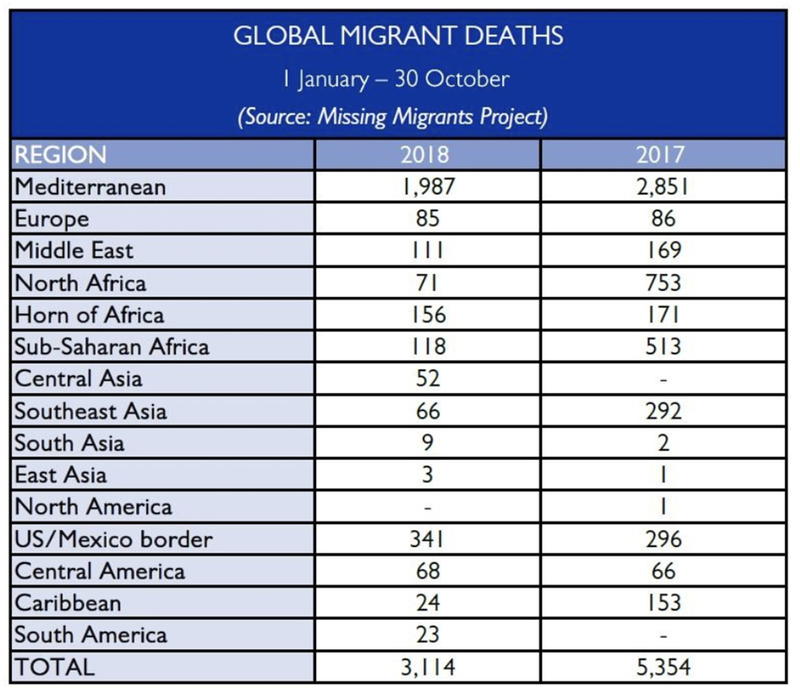 The Mediterranean region, the Middle East, North Africa and the Americas rank among the planet’s deadliest migration corridors, each zone tallying confirmed fatalities of at least 100 in 2018 (see chart below), some into the thousands. At least 219 people have died on their journey during the month of October, most recently two migrants whose remains were discovered in South Texas along the US-Mexico border.